The IWW published many pamphlets in Hungarian and other languages. 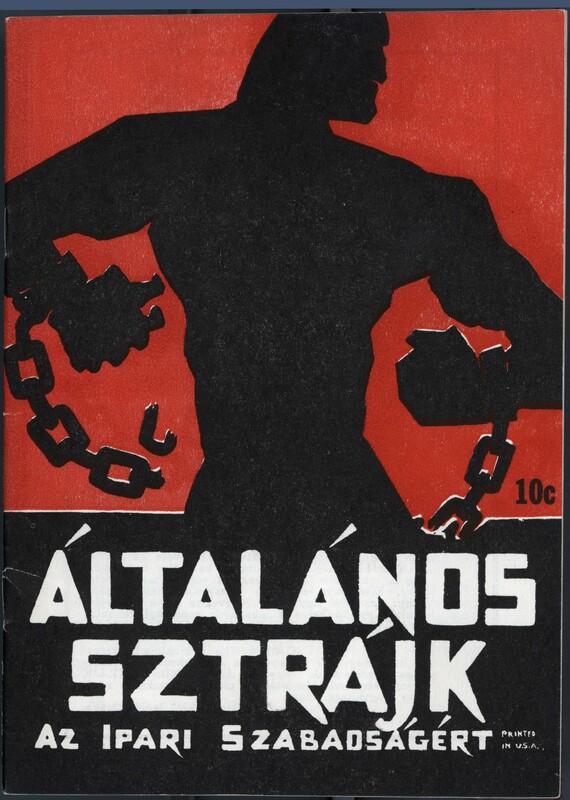 This is the Hungarian-language edition of the classic IWW pamphlet, The General Strike. Bermunkas was published weekly for much of its life, and 17 reels of microfilm spanning the period December 7, 1918 (the paper was published from at least 1912) to December 28, 1946 (the paper continued as a semi-monthly until Oct. 15, 1954) are available at the Walter Reuther Library at Wayne State University. Hungarian Wobblies also issued an annual almanac from at least 1926 through 1954 (according to library holdings listings for Bermunkas Naptara). A Hungarian translation of the IWW chart of industrial unions from a pamphlet, Technocracy or Industrial Unionism, published in 1934 is available here, along with a translation of the explanatory text. For those who can read Hungarian, some of the material published in Bermunkas is archived online. The post office barred Bermunkas from the mail in 1917 (though publication continued) and editor Charles Rothfisher was among the defendants in the massive Chicago prosecution of more than 100 leading Wobbly figures. Rothfisher was sentenced to 20 years in prison, serving eight months before he was released on an appeal bond, and was one of a handful of Wobblies to flee the country rather than return to prison when the Supreme Court ruled that workers had no right to criticize the war policies of “their” government or to carry out struggles to improve their working conditions during wartime. We will add information about and images of Bermunkas as time permits. We welcome submissions of relevant material, including images, translations, etc. There is a small but growing body of literature about the IWW press more generally — particularly the Finnish-language press which has been the subject of several scholarly articles and book chapters. The IWW’s flagship English-language weekly (through the 1940s) newspapers, the Industrial Worker and Solidarity, have received less attention, though there is a web page devoted to the early history of the Industrial Worker and an unpublished dissertation on Solidarity‘s founding editor.